Drawcom’s custom made cables have a proven high reliability in service to meet the demanding requirements commercial, defence, aerospace and science sectors. 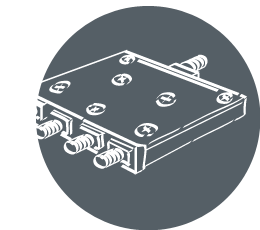 Drawcom’s Passive Intermodulation products supply range from Unequal Splitters, Low PIM Loads, Low PIM Divider/Tappers, Low PIM adaptors to Low PIM Cable assemblies. Our Terminations are available in 30, 50, 100 and 150 Watt models and they offer a VWSR of 1.10:1 typical. We offer unequal splitters that deliver 300 Watts of handling power and a typical VSWR of 1.15:1 and various output levels from -0.9 to -1.8 dB. To prevent field failures all models are designed to handle full rated power @ +85 degrees Celcius. Directional couplers are used in a wide variety of applications and can satisfy almost any requirement for sampling incident and reflected microwave power conveniently and accurately with minimal disturbance to the transmission line. Some general applications for directional couplers include line monitoring, power measurements and load source isolators.